Some restaurant openings in Dublin at the moment are a bit like the Luas strike, over valued and underwhelming. With a seemingly endless supply of fresh faces popping up at unprecedented levels, one has to wonder how the old neighbourhood spots are holding up against the new kids on the block. Just as we discovered last week with the Luas debacle, sometimes the shining new penny loses its gleam and we gladly revert to the old reliables; in our case a local spot in Mount Merrion called Michael’s. Mount Merrion is one of those leafy suburbs where you have to wonder why there are not more dining out options given the comfortable surroundings. Although they now have the addition of Union Café there is really only one spot where you can get authentic food with its own unique charm. Michael’s is a bit of an institution in the area but has undergone a lot of changes in the past twelve months, most notably being bought over by the Kinara group. Rather than change the name and gut the place, the team decided to retain some of the attributes that a lot of the loyal locals loved about the place. What they have replaced however, is the chef. As with all the Kinara venues, high quality cooking and chefs of exceptional character have been key to their success and in this regard Michael’s is no different. Sean Collender clearly has great powers of persuasion as he managed to poach Development Chef Gareth Smith from a plum job in Vienna where he has spent the last six years running two of the country’s most successful gastro pubs. Gareth, or Gaz as he likes to be known, is a seriously talented guy who, as he explained to us on the night, will be overseeing the entire group’s development, but his main focus at present is Michael’s. Having worked in the likes of Chapter One, Restaurant 1014, Ely and London’s revered Ledbury it is clear that he knows a thing or two about good food. 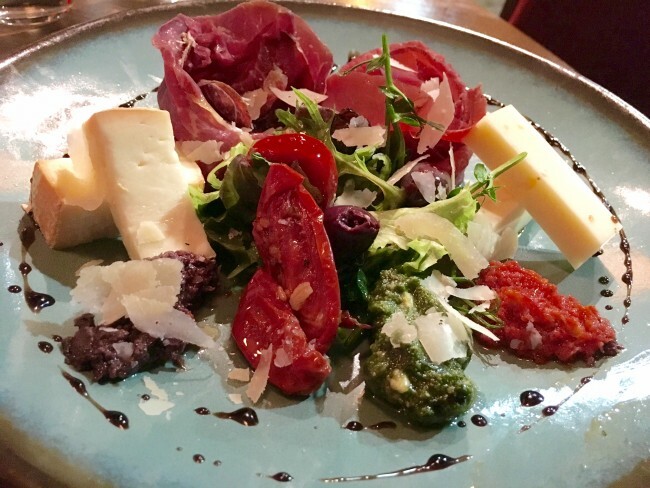 Gaz has kept a lot of the Italian feel to the overall menu but has introduced more of a Mediterranean slant and really upped the game in terms of the quality of the food, especially the seafood. We popped in last Friday and were excited to see what had changed about the place. 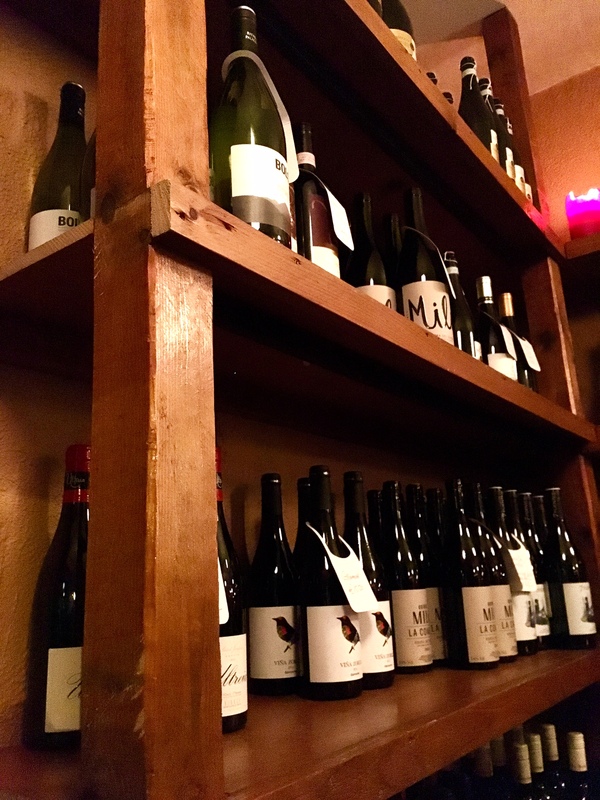 We were pleased to see a lot of the quirky charm of the original Michael’s was still fairly untouched, especially the wine, which the team are planning to continue to invest in. Hopefully we will see some wine evenings return as they have some little gems on their racks. The room still has that rustic feel and warmth about it which is just as well as we were seated at the front by the window. We love the fact that if you fancy just popping in for some flatbreads and a bottle of wine you will be more than welcomed as we witnessed on the night, however we arrived with a bit of an appetite so something a bit more substantial was required. The menu is set out into six options from light bites to antipasti, seafood, pasta and pizza, but the Butcher’s Block caught our eye straight away. The early bird changes from week to week to give diners a chance to experience something a little different each time they come in and starts at €20.95 for two courses, best of all it is on offer all day Tuesday to Thursday. After beginning with some breads and homemade chili butter we settled on a small Antipasta Della Casa (€9.50) which, as it turned out, wasn’t so small after all. A good sized plate arrived with Sheridan’s olives, Italian cheeses, pastrami, bresaola, sun dried tomato, little parmesan shavings and drizzled lightly with a superb balsamic vinegar. 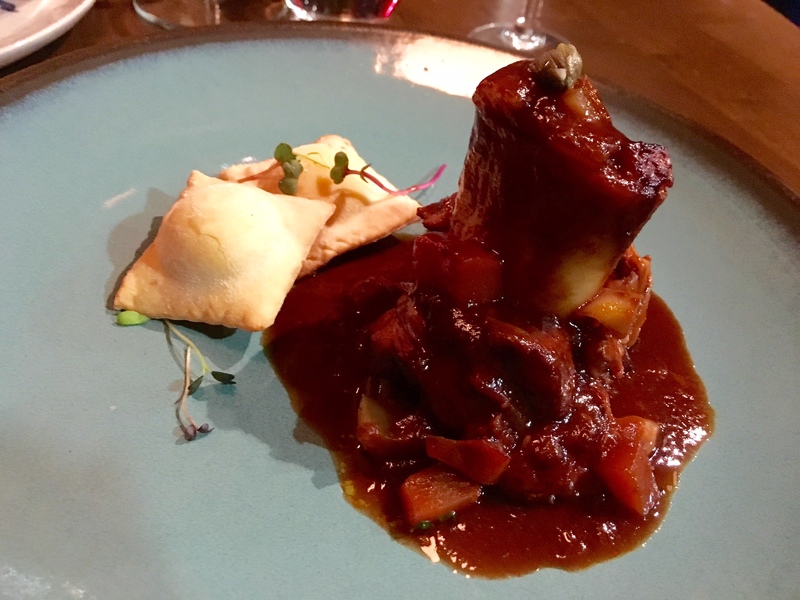 You can’t get more Italian, or so we thought until we tasted our second starter Osso Bucco of Rose Veal Shank (€10). For us this is where Michael’s really stands out on its own as offering authentic Italian food but with a modern twist. The slow braised veal fell apart with the lightest of tickles from the fork and was full of flavour, as were the little parcels of homemade ravioli stuff with warm goat’s cheese. For a tenner this represented excellent value for money. According to Michael’s resident charmer and front of house Talah, who looked after us all night, the seafood dishes were something not to be missed. As it turns out he was right. Having worked with the group for eight years, as we learned later on, it appears he certainly knows his stuff. We were informed Kish Fish had delivered some fantastic wild clams and mussels that morning so had high expectations for the Seafood Linguine (€19.90). Yet again we were presented with a cracking plate of food and we have to commend the fact they offer gluten free options on all their pasta and pizzas. Good honest ingredients cooked beautifully, sometimes people really underrate the passion that goes into cooking a seemingly simple plate of pasta. 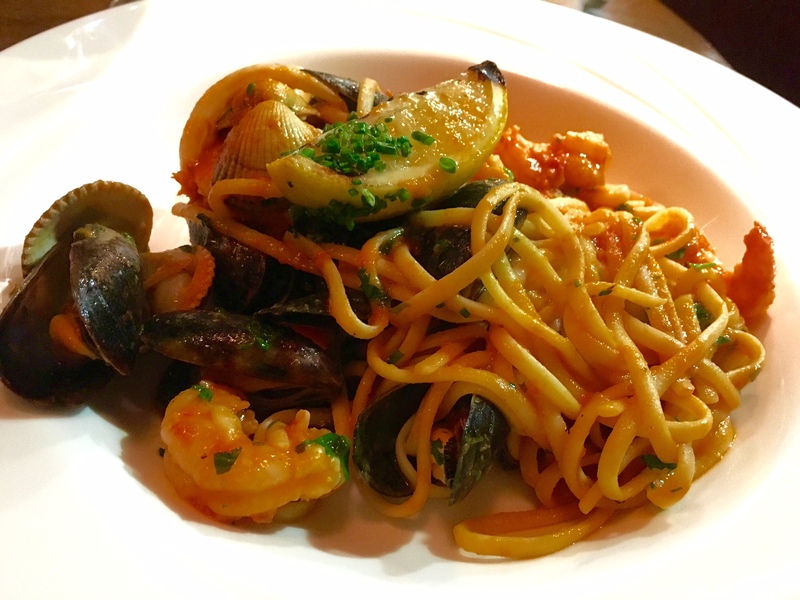 Stuffed with Dublin Bay prawns, wild mussels, parourde clams and tiny baby squid, this linguine is one that you will not forget in a hurry; a tasty showcase of some of the fine ingredients we are blessed to have on our shores. All of the steaks on offer in Michael’s come from Maurice Kettle’s farm and are dry aged in his salt and moss cave for 31 days. Although it took much restraint, we resisted the urge to order the “Bad Boy”, a tempting sounding 16oz Rib Eye and instead wussed out with a more refined 9oz Fillet (€26). Served with a buttery Béarnaise sauce, full fat triple cooked chips and onion rings, this is not a meal for the figure conscious but one that will have the sinful meat lover longing for more. Talah made a good call in suggesting a full bodied, brooding bottle of La Cometa Ribera del Duero 2014 (€39.50) which, if you have never tried it, is a match made in heaven with a good cut of beef. We had come to Michael’s with empty bellies but at this stage there was limited room left. However, seeing three scrumptious looking slices of Pistachio Santiago Tart (€7.50) and a Tiramisu (€7.50) whizzing by to a table of very happy looking ladies next to us was all we needed to sway our weak will. Moist and flavoursome, it was a perfect ending to our Italian romance with Michael’s and the Tiramisu, well we think the empty glass we left spoke for itself. Throughout the night Smith popped in and out to each table for a chat, ensuring everyone was enjoying the full Michael’s experience. This laid back chef has a warmth and infectious passion which leaves us in no doubt that the legacy of Michael’s is on course for an exciting new chapter. Every neighborhood should have Michael’s! This is a Neighbourhood Taste we cannot recommend enough.